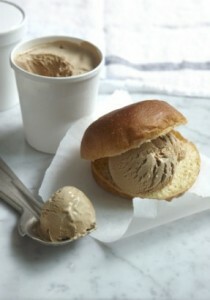 A deep and compelling coffee ice cream that is almost embarrassingly easy. P.S No need for an ice cream machine, only Douwe Egberts! 1. In a large bowl, whisk all four ingredients together until you have an airy caffe-latte-coloured mixture. 2. Fill a 1-pint airtight container and freeze for 6 hours or overnight. 3. Serve straight from the freezer.